After successfully promoted the Yoga Day, now the Indian central government is launching yet another important day in the country namely Rashtriya Ayurveda Diwas (National Ayurveda Day) on the auspicious day of Dhanteras this year. The Modi government had announced about the Yoga Day in 2015. In 2016 the day was celebrated in gigantic way which brought about international acclaim for the country and the government. 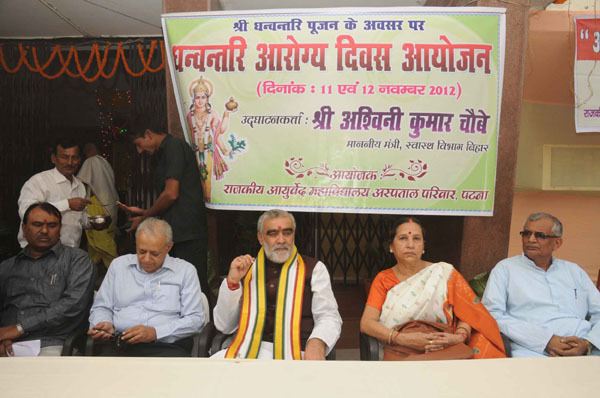 Now this year the central government has announced the Rashtriya Ayurveda Diwas. Dhanteras is a very special occasion for the Hindus when all the people buy metals for good luck. This year the celebration will be doubled as the entire nation will be celebrated Ayurved Diwas as well. On this RAD there will be free diabetes check up and consultancy in almost every ayurvedic hospital across the nation will be conducted. This initiative is called Mission Diabetes or Mission Madhumeh. In every 5 people 2 are diagnosed by Diabetes in India. This is one of the any reasons why many people suffer from different diseases every now and then in the nation. Looking at this situation the Modi government has taken another initiative towards the development of nation. The initiative namely Mission Madhumeh will be arrived on the day of Dhanteras this year when there is also Rashtriya Ayurveda Diwas. Under mission madhumeh, all the ayurvedic hospitals across the nation will form a medical team and conduct a consultancy for the diabetes patients. Patients will be able to know about their health condition through the consultants and also can opt for primary treatment without spending a penny. Also the consultants will guide the patients on how to control the diabetes. Even when you don’t have diabetes how can you avoid having this disease will also be told by the doctors and consultants in the Mission Madhumeh. The objective of having this day is to make people aware about the ayurved vidya in India. Ayurved had originated from India but unfortunately this science is no longer used by the patients. Instead they shift to allopathic treatment and some have shifted to homeopathy. The day will be celebrated to encourage the ayurved treatment as well in India. In recent times Ayurved treatment has developed a lot with new medication and advance treatment. Modi government has keen to promote the same as new sort of treatment can be used to cure many health problems today. The main objective of the day celebration is to encourage Ayurved alongside. Also the main aim of Mission Madhumeh is to spread awareness of diabetes. Conducting consultancy and primary checkups for diabetic patients will lead to more awareness and knowledge about the disease. Also people will know how to control the diabetes. The official day for Rashtriya Ayurveda Diwas is announced on 28th October 2016 on the day of Dhanteras this year. As of now the government only announced the day of Dhanteras. Whether the date will be fixed on 28th or not is not decided yet. Dhanteras comes in different dates every year. If the RAD will celebrate on Dhanteras Day then the date will not be fixed on 28th. Almost in every state the day will be celebrated in the Ayurvedic Colleges and hospitals for the entire day. On 28th October 2016 at 10 am the medical camp for Mission Madhumeh will be started. In Guwahati the celebration will be lasted for 3 long days from 27th to 29th of October. In this 3-day celebration various cultural and health programs will be included. Ayurvedic medical students and doctors will take part in consultancy, primary treatment and such activities on the day across the country.